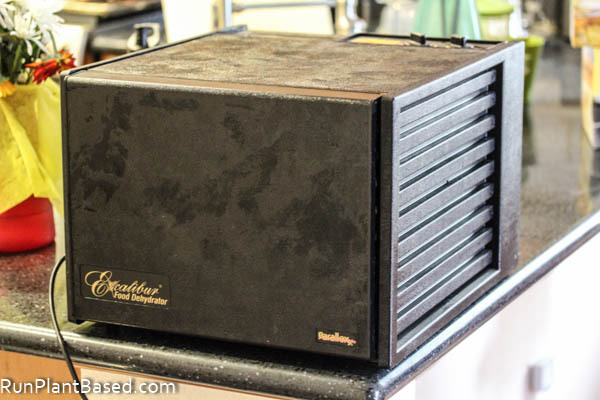 I’m ashamed to say it’s been a long time since I’ve used our Excalibur Food Dehydrator, over a year maybe! I had to dig it out of the back corner of our pantry for this recipe. But I got inspired with this lovely bunch of fresh kale we got in our farm box. And after having a mild hissy fit when I discovered the Sriracha Potato Chips at Trader Joe’s weren’t vegan friendly! Miko would have a fit if I didn’t share the kale stems with him. 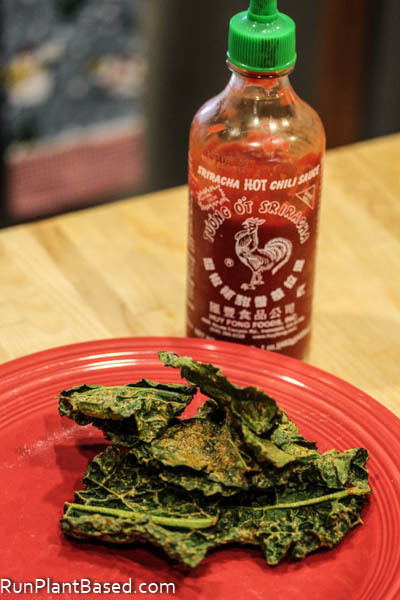 Sure, there are plenty of sriracha recipes out there and even other sriracha kale chip recipes. But not only are these chips loaded with kicky sriracha heat, the sauce is a creamy hemp seed base for a real treat. They’re spicy, cheesy, savory, and crunchy. Also oil free and mostly raw vegan. 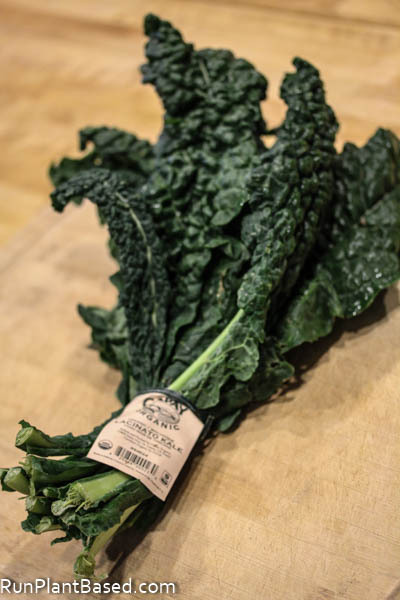 Chop kale into desired sized leaves and remove stems if desired. Place hemp seeds, nutritional yeast, apple cider vinegar, sriracha, water, and salt and pepper into a high speed blender and blend to a smooth and creamy texture. 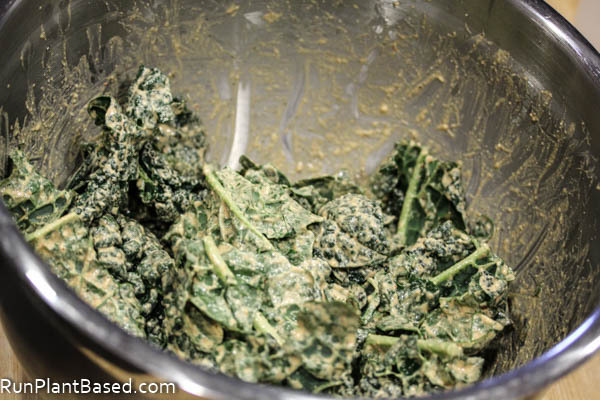 Toss kale and blender mixture together in a large bowl until each leaf is coated with the sauce. 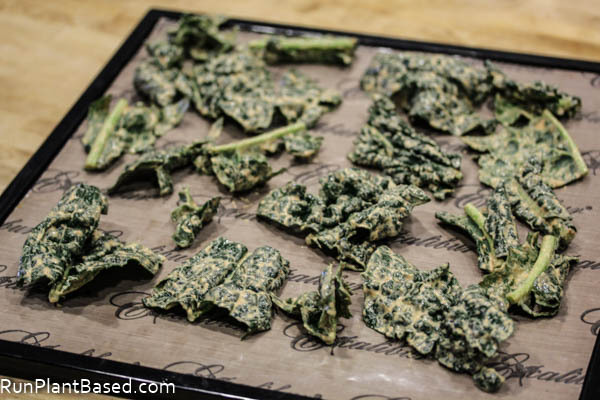 Place kale in food dehydrator on non-stick sheets and dehydrate at 115 degrees until crispy, for 4-7 hours. 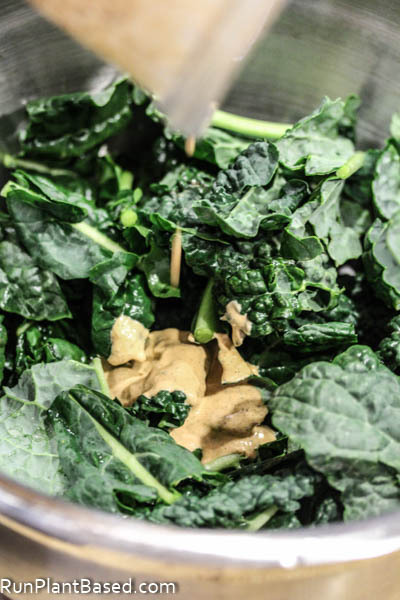 Coating kale leaves in a gooey sauce is kind of fun. And looked delicious before dehydrating! 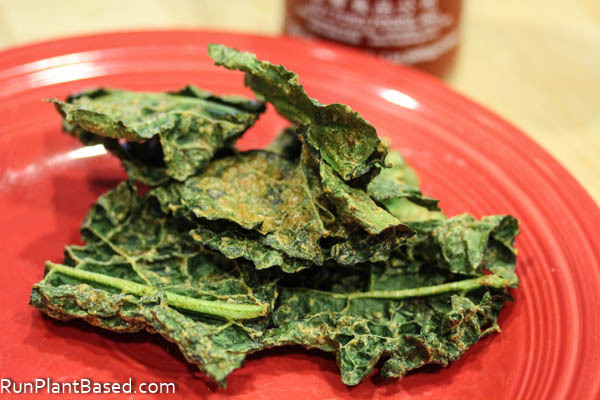 The kale chips take on a nice crispy texture coated with kicky flavor. And would make a great treat for some big game coming up or something. Or just a great treat to have stashed in the pantry! LOL! I’ve seen that look on Miko’s face before. :) What kind of dunce makes a non-vegan friendly potato chip?! That’s crazy! 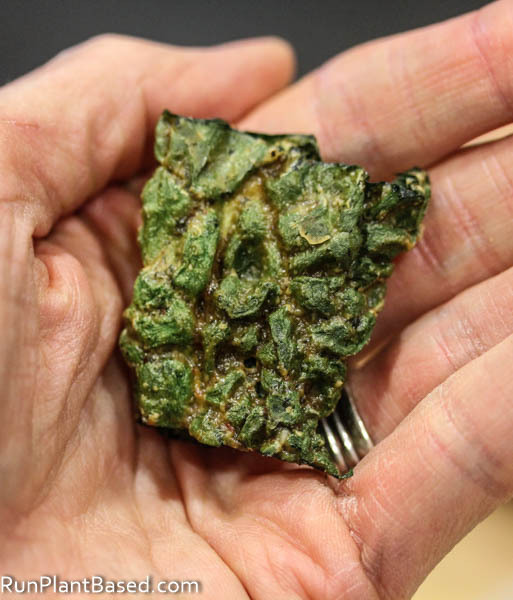 Your kale chips are healthier and look much better than potato chips. Thanks and agreed on the potato chips, they were so close but had honey. Ugh! 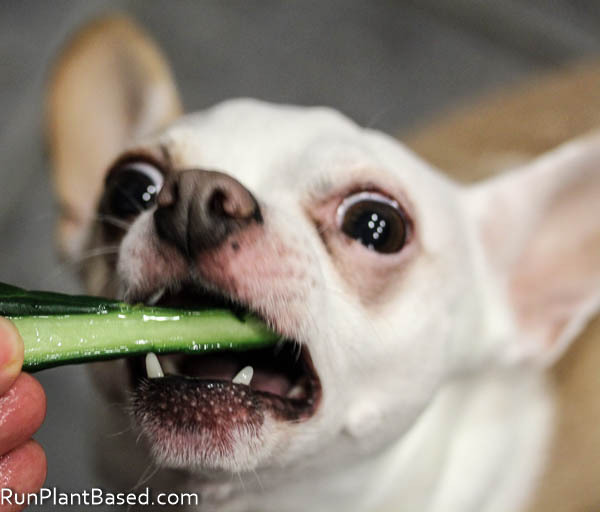 I would never of thought dogs would dig kale stems but I guess that makes sense! He loves chewing on the stems like treats and will even take them from the garden. THIS IS SUCH A GOOD WAY to get KALE down!!!! So many people ADOREEEEEEE spicy!! Thanks and spicy is a huge trend now, crazy all the new hot sauces out there!